After driving my $800 Jeep Grand Wagoneer 1,700 miles from Michigan to Utah, I finally got a chance to take the big Woodie off-road. And my god was it glorious. Much more so than I expected. When I bought Project Redwood a few months ago, the big Jeep hadn’t run in over 12 years. So to think that I could somehow wrench it back to life on my tiny budget, drive it 1,700 miles, and off-road it was a bit of a dream. Especially since four-wheel drive didn’t work. 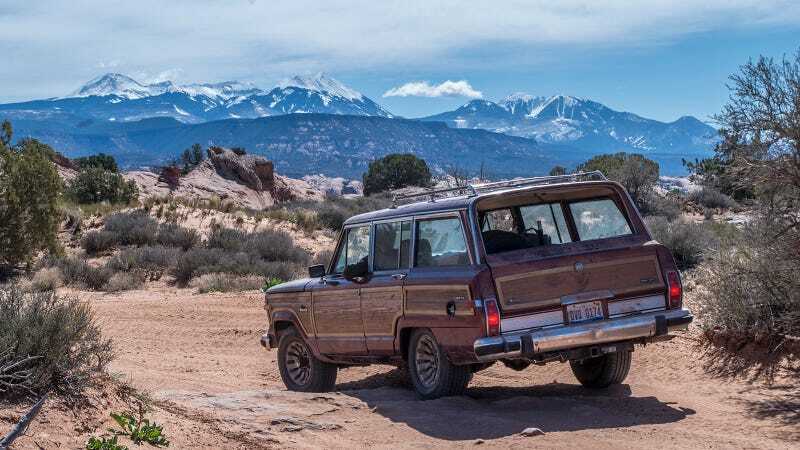 I had to leave later that day to drive back to Michigan and then fly to Germany for a funeral, so this was it: get four-wheel drive and low-range working, or drive home without ever hitting the rocks of Moab, the off-road Mecca of the world. Naturally, I had no intention of taking that second route. So I installed the front driveshaft, jacked up the front of the Jeep, disconnected the Grand Wagoneer’s vacuum-actuated four-wheel drive diaphragm, and used a long flathead screwdriver to move a linkage and force the transfer case into four-wheel drive while Andrew spun one of the front tires. “Click,” went the transfer case, as I pivoted the screwdriver, and the spinning front wheel came to an immediate halt. We were in business. Sort of. Four-wheel drive without low-range wasn’t going to be enough. Not for a 4,500 pound behemoth with a transmission that loves to make heat, and axles that have tall 3.31 gears. I asked Andrew to put the truck into neutral, and start yanking on that low-range lever so I could see what was going on below. It immediately became clear what the issue was. Instead of actuating the low-range in the transfer case via a linkage, pulling the lever simply moved a bracket on which that linkage pivoted. If the bracket moves, the linkage won’t work. Upon closer inspection, I found that a nut located between the transfer case and the Jeep’s floor—a nut that held the bracket in place—was missing. After installing that (this took forever, as access was limited), and after the aforementioned flathead-actuated four-wheel drive success, we headed to the trail in four-wheel drive high-range. When we got to the trailhead, Andrew and I looked at each other, I slid the transmission shifter into neutral, and we prayed. I yanked the transfer-case lever back, and with a wonderful, positive click, the Jeep lurched as it entered low-range for the first time in over a decade. The next two hours were some of the most fun I’ve ever experienced in an automobile. Even though I had initially wanted to tackle the Seven Mile Rim trail, I settled for Fins And Things because I didn’t want to jeopardize spending time with my family, and also because my friend Tony from Dynatrac volunteered to act as the support vehicle. This was a great decision, because I had a blast. Tony, who used to work just a few desks down from me at Fiat Chrysler, is an expert off-roader and fabricator. Just look at that insane machine—called the Code1—he and his colleagues at off-road drivetrain company Dynatrac put together. Yes, those are 42s, and yes, that’s a two-door long wheelbase JL. That custom Wrangler was so tall, I could almost see his undercarriage from my Jeep. Tony “spotted” Andrew and me through the obstacles—a tall task considering how big the Jeep’s rear overhang is, how much the rear leaf-springs sag, and also the fact that I hadn’t had time to replace the fuel tank skid-plate. But the former JL Wrangler product planner did a great job, helping Project Redwood make it up the obstacles without any drama sans a few scrapes on the trailer hitch. That noise in the video above, it’s worth mentioning, is the fan rubbing against my ill-fitting fiberglass fan-shroud, which I still need to shave down a bit. The engine itself is in excellent shape, and produced enormous swathes of torque that sent the big wagon ascending steep grades with only a small application of throttle. Andrew is right about that. The brakes, which I dialed in right before our trip, were fantastic on the trail, holding the Jeep on steep grades, and stopping all four wheels evenly and with real authority. Being able to having confidence in your stoppers is a requirement for any off-road driving, and it made this trip so much more fun. Even if it took a bit of off-roading for Andrew to trust my wrenching-job. I wasn’t expecting the Wagoneer to be able to do much on the trails. With its limited ground clearance, big rear overhang and lack of underbody armor, I was sure we’d cause body damage or underbody component damage before we ever got to have any real fun off-road. But I was wrong. Thanks to a torquey engine, low range, decent tires, a fantastic spotter and some decent driving, Andrew and I were able to pilot Project Redwood through terrain that we didn’t think we’d be able to traverse. And that’s the true joy of off-roading, really—finding out that the limits of your vehicle and your driving skills are actually much higher than you ever expected. So no, this year’s Moab project didn’t do the hard trails that last year’s 1948 Willys CJ-2A and the previous year’s $600 Jeep Cherokee XJ covered, but that didn’t make off-roading in Moab any less fun. As you can see in the video above, I had the time of my life. But minor damage notwithstanding, Project Redwood was fantastic out there on the rocks. Of course, just because the Jeep made it to the off-road trails Moab, doesn’t mean I’m out of the woods quite yet. Andrew and I still have to drive 1,700 miles back to Michigan. I sincerely hope the Jeep holds up, because I’ve got another tight deadline to meet.